A £1 FACE MASK BURNT MY SKIN OFF! 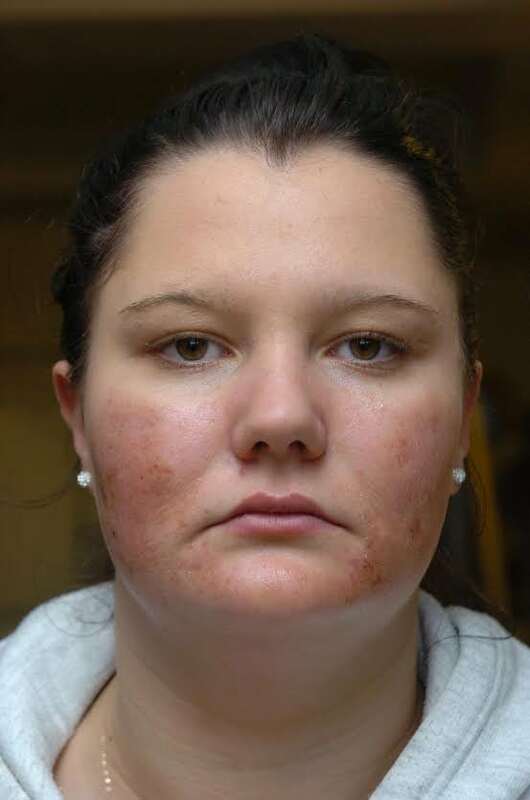 Chantelle, 19, is scarred for life after a £1 beauty regime went horribly wrong. 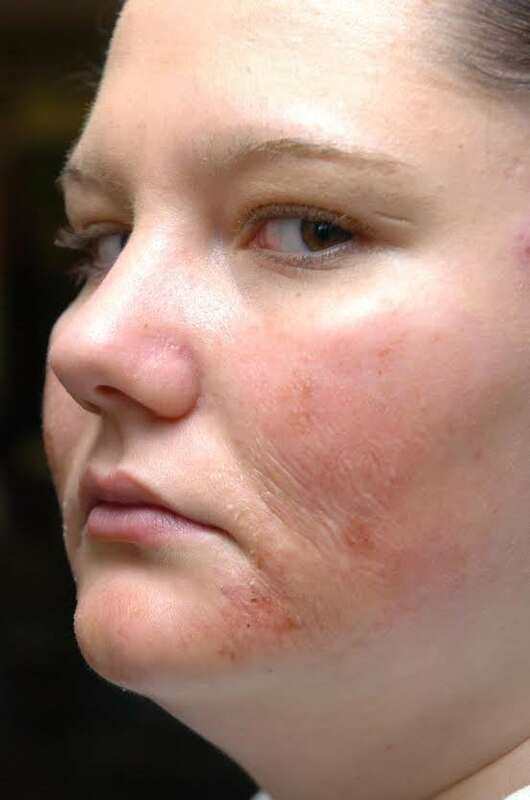 She shares her true story ‘face mask burt my skin off’. SellUsYourStory.com help hundreds of people every month share their story with the national press for cash. We are the largest independent press agency in the UK, we guarantee the highest fees and ensure your story is told your way. 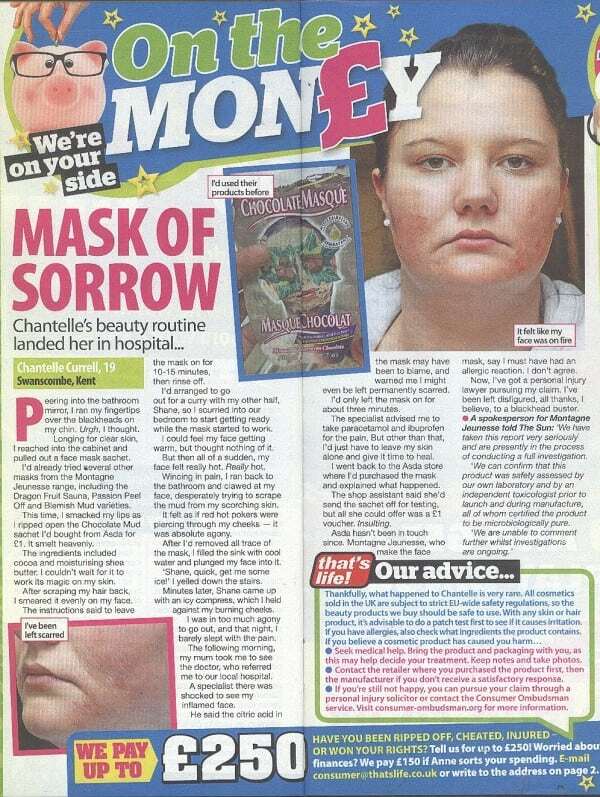 When Chantelle contacted us saying ‘a face mask burnt my skin off’ we knew the newspapers and magazines would be interested. I reached into the cupboard and picked out my trusty, favourite face mask. I’d tried them all – the chilli sauna mask, the passionfruit peel, the fudge sundae and even the citrus blemish buster. This time, I smacked my lips as I ripped open a chocolate mud face mask as its smell was just heavenly. At under a quid, it was a bargain too – so it was no wonder I used them all the time as part of my skincare routine. Smearing it on my face, I was a pro at evenly spreading out the mud mask so it covered all the nooks and crannies. With an extra rub at my blackheads, I decided to start getting dressed to go out for a curry with my other half, Shane. Scraping my hair back from my face, I flung open my wardrobe and hoped for some inspiration. I could feel my face getting warm, and I thought nothing of it at first – but suddenly there was an intense heat. My cheeks were burning. Screaming in pain, I ran back to the bathroom and clawed at my face to try and get the scorching mud off. I did everything I could to get rid of the pain, with tears screaming down my fiery cheeks I drenched my face in freezing cold water. It felt as if hot iron rods were slicing through my cheeks and searing my skin – it was absolute agony. 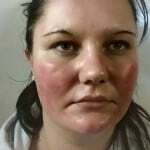 I started feeling faint and my vision was blurring from the puffiness and swelling from where I had applied the mask. After countless icy face towels and much hysterical sobbing, I was rushed to A&E where I sat for hours while my cheeks blistered and my lips cracked. What made it worse is that people were sniggering at my cerise pink face, and they were laughing behind my back. Eventually, a burns specialist examined me and said that I had third degree burns and my blistered cheeks could become infected if I wasn’t careful. I was scarred for life – at the tender age of 19. A £1 face mask had burned my skin off. 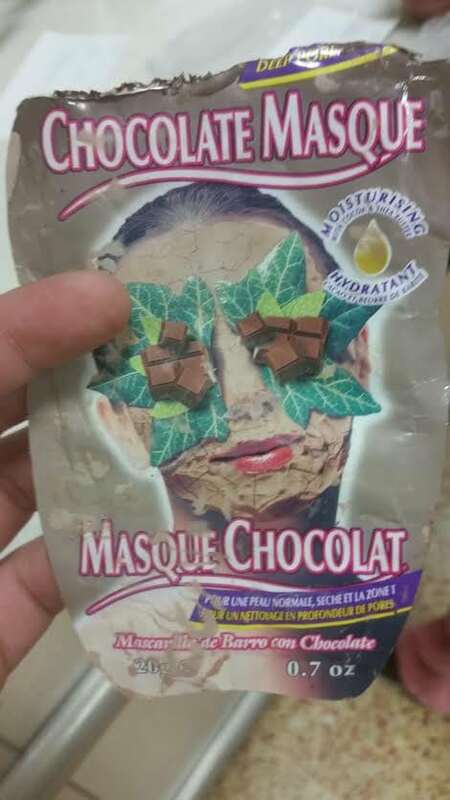 I had only left the mask on for about three minutes too, even though the pack recommends 20 for best results. Over the next few days, I could hardly sleep, eat or even breathe without it feeling like sheer torture. When I visited the ASD A I bought it from, they could see my white, scarred cheeks and humiliatingly only refunded me £1 for my trauma. Now I’m too afraid to leave the house without people thinking I’m some sort of freak or zombie. My life has been ruined, from a three minute blackhead buster. A Montagne Jeunesse spokesman said: “We can confirm that a report has been received of an alleged reaction to this product. We have taken this report very seriously and are presently in the process of conducting a full investigation. “We can confirm that this product was safety assessed by our own laboratory and by an independent toxicologist prior to launch and during manufacture, all of whom certified the product to be microbiologically pure. We helped Chantelle sell her story exclusively to That’s Life Magazine, who outbid rival magazines for the rights to print Chantelle’s story. If you would like us to auction your story to the highest bidding magazine, get in touch using the story valuation form on this page. Have you been the victim of domestic violence? We help hundreds of brave victims share their stories with the press to help warn others in similar situations. It’s important to highlight the issue through the media and raise awareness. We helped Suzanne Thomas, 32, tell her story. 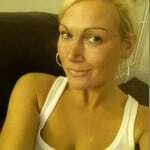 Police said it was ‘one of the worst cases of domestic violence they have ever seen’. Slipping on a pair of stilettos I glanced at my reflection in the mirror one last time before leaving my home in Nottingham for a night out with the girls. “Let’s get going ladies,” I called out to my friends before we tottered down the road and into the waiting taxi. As usual I was wearing one of my signature mini dresses to show off my tanned legs. Feeling confident in my freshly bronzed skin, I couldn’t help but smile when my friend told me that Jason McLean was out tonight. I’d met Jason through mutual friends a few weeks earlier and I couldn’t wait to see him again. Luckily he seemed just as keen as me. After spending all night by each others side we spent the next few weeks exchanging text messages. I suggested we kept things casual at first but I soon became smitten with how sweet and charming he was. “He’s so protective of me,” I gushed to my friends, “I feel like I could trust him with anything.” In March 2013 I was delighted when we finally made our relationship official. Five months later I asked him to move in with me. It seemed like the next natural step for us but the reality of living under one roof together didn’t turn out to be as perfect as I’d hoped. Jason and I were bickering more than we talked. He would pick fights over the smallest things and on one occasion he really lost his temper and gave me a shove that smashed my head into a wall. “Sorry Suzanne,” he muttered later but I didn’t feel like he truly meant it. I found myself tip-toeing around him more and more, frightened of doing anything to annoy him because I didn’t know how he might react. Things were getting out of control and I didn’t feel like my usual bubbly self any more. Reminding myself that he was the one living in my house, I plucked up the courage to confront him about his mood swings. “Things just aren’t working out Jason,” I told him firmly. “I want you to pack up your things and move out of my house.” I was disappointed to be calling time on our relationship so soon but deep down I knew I was making the right decision. Jason packed a bag and left the same day saying he’d collect the rest of his things later. My friends did their best to cheer me up and suggested I meet them at a pub in town rather than sitting alone at home. While we were out I had a few missed calls from Jason but I just wanted to forget about him and switched my phone off. At half four in the morning my friends and I decided to call it a night and one of my friends offered to walk me home. As soon as we approached the front door I noticed something wasn’t quite right. “That’s strange, my living room window is wide open.” “Did you not leave it that way?” said my friend. “No” I replied shaking my head in confusion. Then through the glass I spotted a figure lurking inside. It was Jason. In his hand I could make out a large knife with a black handle that I immediately recognised as one from my kitchen. He pushed the window open further and leapt through it. As he approached me all I could see was the rage burning in his eyes. “Just calm down, Jason,” I said as softly as I could as he ranted and called me a slag. He demanded I open the front door with my key and I was so scared I thought I had no choice but to do what he said. The next thing I knew he’d pulled me into the house and pushed me to the ground. I lay pressed to the carpet as he stamped repeatedly on my head and face. “Please stop!” I yelled through my sobs but there was nothing I could say to get through to him. Wrapping my arms tight across my head I tried to protect myself as best I could but as the kicks continued I slowly began to lose consciousness. When I woke the first thing I saw was Jason standing over me. He was clutching my kettle in his hands. Then I felt sharp splashes hitting my lap as I lay on the ground. Jason continued to empty the freshly boiled water over my stomach and onto my arms and legs. “Do you want another one?” he screamed at me. I didn’t have a choice. Before I could plead with him he dissipated back to the kitchen to boil a second pot. I feared for my life but thankfully, Jason was stopped in his tracks by the blare of police sirens getting closer. My friend had managed to flag down a passing car after Jason had dragged me into the house. The officers burst in but not before Jason had managed to escape by scampering out the back door. When they found me I was in complete agony and had to be taken to hospital straight away to have the burns scrubbed and assessed in theatre. The hospital staff gasped when they saw the extent of my injuries. I suffered third degree burns and they told me that if Jason had succeeded in pouring the second kettle I might not have survived. After I had a CT scan to assess the damage to my head I was put on a special unit to recover as my blistered skin was shedding frantically. When the bandages were taken off to be replaced I could see the drip marks etched on my skin where each bit of scolding water had splashed me. The pain was so bad that it would take weeks before I could even attempt to walk again. Although I was slowly recovering my nightmare still wasn’t over. The police still hadn’t caught Jason and I was sick with fear that he was on the loose. Then one day as I lay in my hospital bed my worst fear came true – Jason came to pay me a visit. I froze as his eyes scanned over my bandages taking in the extent of the damage he caused. “You haven’t seen anything yet, if you think this is bad see what comes next,” he sneered. I desperately wanted to scream out and run away but I was hooked up to morphine drip and in so much pain. Luckily Jason didn’t stick around. As soon as he was gone I told a nurse what happened and reported it to the police but weeks later there was still no sign of him. After leaving hospital I moved in with my Mum to help with my recovery. We had a panic button installed in the house because I was so frightened Jason might come and see me again. 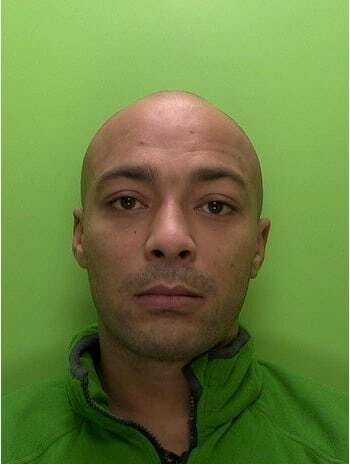 Finally, in November 2013, a month after the attack, Jason handed himself into the police. He pleaded not guilty to all charges so I had to give evidence against him in court. As he stood in the docks he showed no remorse for his actions. He smirked at my family and laughed when evidence was being given. But thankfully I got the justice I deserved when he was found guilty of Grievious Body Harm with intent and sentenced to 14 years. In their statement the police said it was one of the worst cases of domestic violence they’d ever seen. Knowing he’d be inside for such a long time was a relief but it won’t take away the scars I’ll carry for the rest of my life. What Jason did to me that night has completely changed my life. Before the attack I loved showing off my figure and tanning my skin but now I’m unable go outside at all without applying a high factor sun cream. I’ve been warned against swimming in chlorine pools but I can’t even face having a bath as my fear of water still haunts me. One of the hardest things to deal with is knowing that Jason was someone I trusted and loved. I don’t think I’ll ever be able to let someone get close to me again. If you have a domestic abuse story that you would like to share with the media, we are here to help. Not only will we hold your hand every step of the way, we will ensure that you get the best fee for yourself or a charity of your choice. Nothing will ever be printed without your permission and we can make sure that everything is checked by you before it appears in a magazine. Simply contact our friendly and professional team using the ‘story valuation’ form on the right hand side of this page. Just provide a brief outline of what happened to you. This will go straight to our features team who will call you or email you back. You can see a small selection of domestic violence stories that we’ve written for women’s magazines here: https://www.sellusyourstory.com/news/category/domestic-violence-abuse/ You can also read more about selling a story to a magazine on our sell my story page.